UK revenue bosses have given a frosty initial response to suggestions they could run the collection of Scotland's planned local income tax. The Holyrood government is committed to replacing the council tax with the new alternative, set at a standard 3p rate. HM Revenue and Customs told BBC Scotland it operated the reserve central tax system, not a local one. But Scottish Finance Secretary John Swinney said detailed discussions were still to take place. The Scottish Government will launch a consultation on its plans within the next few days. Ministers have also held "constructive" talks with the Liberal Democrats - who also want to scrap council tax - on gaining their support. The minority Holyrood government needs support to get the plans through parliament, but the Lib Dems said they wanted to give councils the powers to set tax. Mr Swinney told BBC Scotland's Politics Show he was working on the assumption that a co-operative arrangement with HM Revenue and Customs could quickly and efficiently establish and collect the local income tax. But the UK department said it operated the reserved central government tax system, not a local tax system, adding that it was a matter for the Scottish Government if they wished to introduce a local income tax using their own powers. Mr Swinney said the forthcoming consultation was the correct way to proceed, adding: "There is a lot of discussion to be undertaken with revenue and customs and revenue and customs will be consulted." He went on: "I hope they are willing to assist us in this particular initiative, because it would be an efficient way to go about the collection of the local income tax." Mr Swinney also said the UK Government was "just plain wrong" on the issue of withholding £400m of council tax benefits, should the system be scrapped in Scotland. Westminster ministers argued that, if the tax went, the benefit would have to go as well, but Mr Swinney said the Scots administration was entitled to the cash under the UK Treasury financial settlement. Meanwhile, Labour and the Conservatives rubbished the SNP/Lib Dem talks. 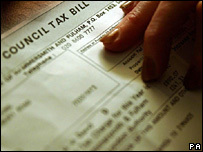 Tory finance spokesman Derek Brownlee said: "All the effort that is going into talking about versions of local or national income tax hikes would be much better spent on reforming the council tax - that could be done in a matter of months, not years." Andy Kerr, Labour's local government spokesman, added: "The SNP and Lib Dems are like the two ends of a pantomime horse, each pulling in a different direction and neither knowing which way to go next." A deal between the SNP and Lib Dems would leave the government short of a majority of 65 MSPs in the parliament which could come from the Green Party, which supports a land value tax.